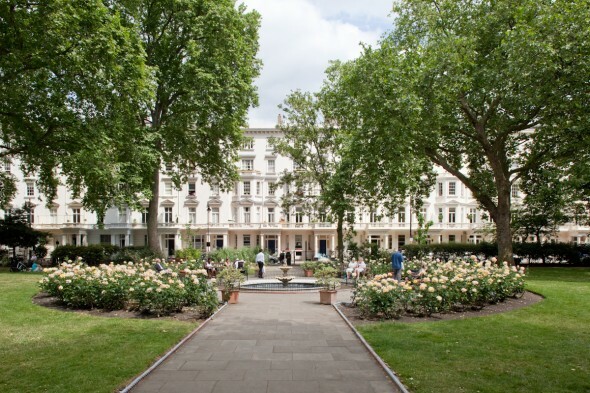 Did you know: St George’s Square is London’s only residential square open to the River Thames. The first residents moved to the square in 1854. Until 1874 the square had its own pier for steamers. St. George’s Square, in the heart of Pimlico, borders on its south side with the river, just a few metres walk from Vauxhall Bridge. It covers a considerable space of ground, and is bounded on the north side by Lupus Street—named after a favourite Christian name in the Grosvenor family, perpetuating the memory of Hugh Lupus, Earl of Chester after the Norman Conquest. The Church of St Saviour (1864) stands at the north end of the square; it was designed by Thomas Cundy the Younger, who was the surveyor for the Grosvenor estate. The square consists of a large area of lawn in the centre, paths and shrubs around the edge and a separate dog area at one end. It is a formal London Square set at the heart of a series large grand white stucco buildings in Pimlico. 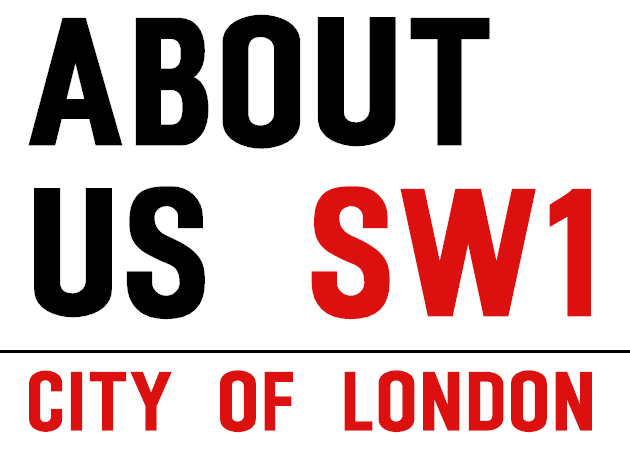 An additional small rectangular area is at the junction of Lupus Street and Belgrave Road. 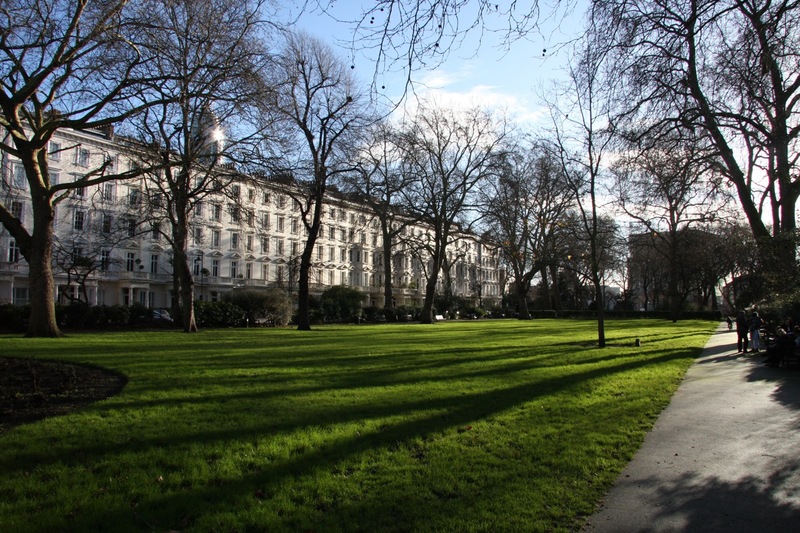 Pimlico’s development was started in 1835 by the Marquess of Westminster who owned the land. The construction of both the buildings around St George’s Square and the square itself was largely supervised by Thomas Cubitt. St George’s Square was originally laid out in 1839, at this time it simply consisted of two parallel streets running north to south and by 1843 it had been transformed into a formal square, and became a fully residential square in 1854. It was a highly desirable place to live as it was London’s only residential square open on one side to the River Thames and up until 1874 the square had its own pier for boats and steamers. The garden remained in the ownership of the Duke of Westminster with maintenance undertaken by the lessees and occupants of the houses in the square, overseen by a Committee made up of residents. In 1928 it was described as ‘well-kept and attractively laid out with lawns, flower beds, etc.’ and it contained ‘some fine trees’. The layout of the garden is little changed and it still retains its 19th century character; with an ornamental fountain, flower beds and mature trees, mainly around the perimeter. These are predominantly London plane but there are also sycamore, ash, horse chestnut, tree-of-heaven and red-flowered hawthorn, and an English elm tree. At the northern end is the site of an underground bomb shelter, now planted over. The southern end of the garden is an area of rough grass that is reserved for the use of dog walkers. A triangular garden enclosure to the north of the main gardens is not publicly accessible. To the north of the Square is a cabmen’s shelter erected in 1893 by the Cabmen’s Shelter Fund, and Pimlico Academy, built in the 1970s, lies to the west of the square. St George’s Square was in the parish of George Hanover Square and was named after the patron saint of England. 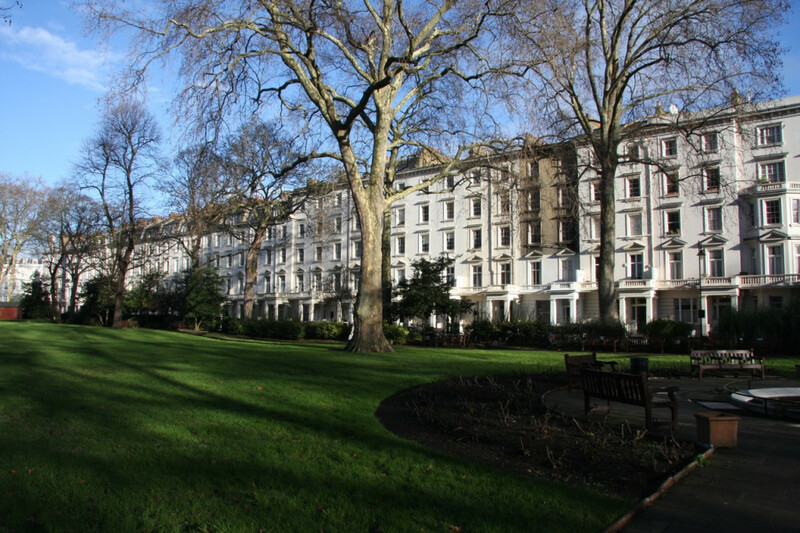 At the end of the southern extension of the Square is Pimlico Gardens. The Square is relatively spacious, open to all local residents and their friends and is a very pleasant peaceful space to spend a summer’s afternoon or evening.